These are technologically advanced, high-tech products built with perfection & precision. 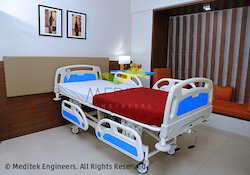 These beds have been envisaged considering the complexity of the ICU operations and the critical stage of the patients' health. 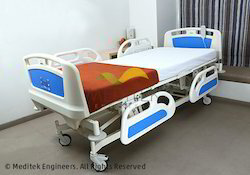 They provide maximum comfort to the patients and efficiently support the latest healthcare practices. Electric Actuators for Backrest and Height Adjustment. Manual Operation for Knee-rest, Trendelenburg / Reverse Trendelenburg position. Stainless steel telescopic IV rod. Easily removable polymer molded head and foot end boards for easy access to the patients. 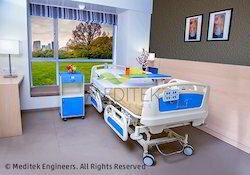 Conveniently mounted nurse control panel at the foot end of the bed enables the staff to easily control all the functions of the bed and to lock individual function of patient handset if required. Electronic CPR button on the nurse control. Looking for ICU Advance Care ?